AID AGENCIES IN Africa have warned that tens of thousands of people in South Sudan face death by starvation after famine was declared there this week. Up to 100,000 people are currently living in areas affected by famine in the central African country, with charities and the UN warning that unless emergency aid is delivered fast, many more areas will be affected. 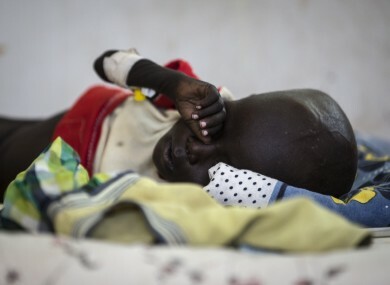 Famine was declared in two counties in South Sudan on Monday, only the second one to be declared since 2000. The only other famine was in Somalia in 2011, where at least 260,000 people died – half of them children under the age of five, according to the UN World Food Program. The International Rescue Committee said Wednesday that the famine designation in South Sudan meant that people were already dying and that the international response was too late. “These crises remain among the least discussed and most underfunded in the world despite their extraordinary scale, scope and man-made origins. This is absurd,” said Ciaran Donnelly, international programs director at the IRC. “The IRC and other aid groups have been raising the alarm of an impending famine in South Sudan for months, and instead of taking the warnings seriously, it fell largely on deaf ears,” he added. There are also further threats of famine in Somalia, Yemen and parts of Nigeria, with hundreds of people facing potential starvation. So what’s happening in South Sudan? South Sudan (officially Republic of South Sudan) is the world’s youngest nation. It gained independence from Sudan following a referendum in 2011. The landlocked African country has been embroiled in civil war for the past three years. The conflict began in 2013 when President Salva Kiir accused his rival and former deputy Riek Machar of plotting a coup against him. Fierce fighting has been ongoing since, with both sides drawing strong international criticism and condemnation from countries and aid groups. The civil war has forced people to flee, disrupted agriculture, sent prices soaring, and seen aid agencies blocked from accessing some of the worst-hit areas. This resulted in the “man-made” famine being declared in parts of the northern Greater Unity region, where 100,000 people are facing starvation and another one million are on the brink of famine. A total of nearly five million are going hungry. UNICEF warned that over 270,000 children are malnourished across the country, with 20,000 children living in the famine-affected area. More than 300,000 South Sudanese refugees have arrived in Sudan since the war erupted, according to the UN Refugee Agency UNHCR. Over 65% of the refugees are children, with many of them arriving with critical levels of malnutrition, it said. International human rights organisation Human Rights Watch (HRW) has condemned both sides of the conflict as well as the international community for failing to assist the people of South Sudan. “It underscores the complete failure by government, opposition forces, and international actors to end the cycle of abuse,” HRW said in a statement. The people of South Sudan were abandoned by their leaders a long time ago. The UN Security Council and regional organisations have failed civilians. Today’s famine is the price of inaction. Aid agencies in operation in South Sudan have pleaded with people across the world to assist the people in need in the country. 27 humanitarian groups working in the country warned that unless substantial funds are immediately provided, the famine will spread across the country. The groups said that unless their requests are acted upon, the number of people going hungry could increase to more than 5.5 million by July 2017. The United Nations has called for its members to give $1.6 billion (€1.5 billion) to help the country cope with the crisis. The UK this week pledged £100 million and the EU pledged €82 million – but charities say this money needs to be delivered soon. Meanwhile, South Sudan’s president Salva Kiir vowed the government would ensure aid could reach the areas hit by famine. In an address to parliament, Kiir said the government “will ensure that all humanitarian and development organisations have unimpeded access to needy populations across the country”. One humanitarian worker in South Sudan – speaking to AFP on condition of anonymity – said that the president’s announcement could give leverage in negotiations on the ground, as gaining access to hungry communities often meant tricky talks with an array of actors in the crisis. Pete Walsh, country director of Save the Children, said that South Sudan was an extremely dangerous place for both its citizens and international workers trying to help them. “In the last three years, at least 71 aid workers have been killed, the vast majority being South Sudanese,” he said. Rain season will hit the country in April, with charities warning that funds must be released to workers on the ground to provide assistance to people in need, as it will become much more difficult to deliver aid once the rains start falling. Email “Explainer: Why tens of thousands face starvation in war-torn South Sudan”. Feedback on “Explainer: Why tens of thousands face starvation in war-torn South Sudan”.